Veneers are wafer-thin, custom made shells that cover the front surface of teeth to change their color, shape, size, or length. 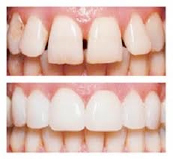 Veneers are routinely used to fix discoloration, chips or broken teeth, misalignment, and gaps between the teeth. This is a great option to get your smile just the way you want it and we always guarantee 100% satisfaction. Not sure what treatment option is best for you? Click here to schedule your free consultation today to get started on treatment options catered to your specific needs.